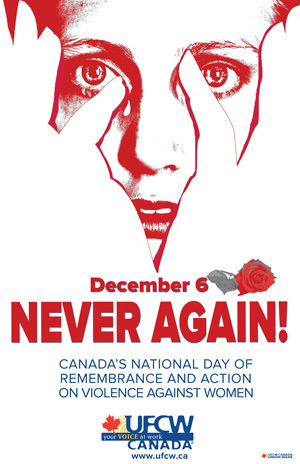 Toronto – December 6, 2018 – On December 6, the National Day of Remembrance and Action on Violence Against Women, communities across the country gather to commemorate and reflect upon the tragic loss of 14 women students at Montreal’s Ecole Polytechnique who were brutally murdered in 1989, simply because they were female. Sadly, almost 30 years later, young women aged 15-34 remain at the highest risk of being the targets of violence. Find out more about UFCW Canada’s work to end violence against women and girls. Take action and participate in the #NotOkay campaign.